Upgrade your kitchen without spending your whole paycheck! 2. A three-tier wire basket so you can thoughtfully display those fruits and vegetables that have been sitting in the middle of your kitchen table for weeks now. Get it from Amazon for $13.04+ (available in copper and chrome). 3. An electric hot pot you'll be so egg-cited to use because it cooks noodles, steams vegetables, makes oatmeal, boils eggs, and reheats soup. Oh and not to mention, it also boils water! It also includes an egg tray for making hardboiled eggs and a steamer tray for steaming veggies! 4. A wine decanter and aerator that'll make you feel like your home is a five star restaurant, even if you're drinking a $5 bottle of wine. 5. A sleek stovetop espresso maker that will help make your morning cup o' joe quickly — so much so that you may never want to buy a cup of coffee again. 6. 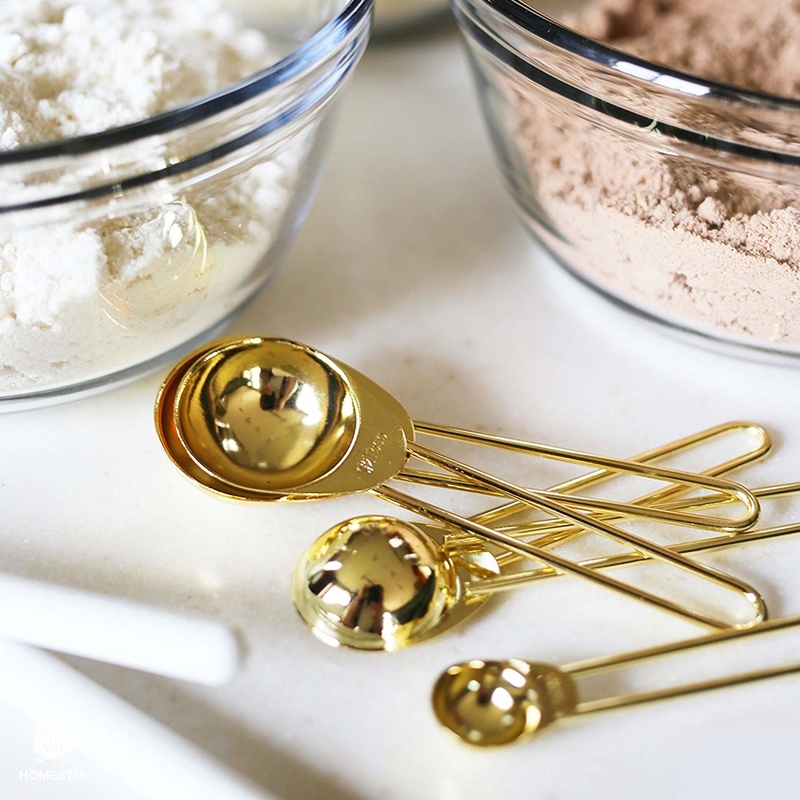 A gold measuring spoon and cups set with a removable loop so you can store them and then grab the 1/4 cup easily without rummaging through the whole drawer. Get it from Amazon for $16.99 (available in copper and gold). 7. A mini waffle maker that'll make you feel like you're staying in a hotel when you use it on Saturday morning, but without, you know, that pricey hotel room bill. 8. A large marbled cutting board that's a ~cut above~ all the others you've used over the years. You may not even want to use this, it looks so nice. It is recommended to hand wash this. 9. An ice bucket so ~chill~, you might use it to hold other, non-ice things when you're not throwing a party. 10. An electric wine opener so you can uncork bottles in seconds, and never struggle with that crappy opener you picked up somewhere along the way that takes about 15 minutes (and a lot of struggling) to work. 11. 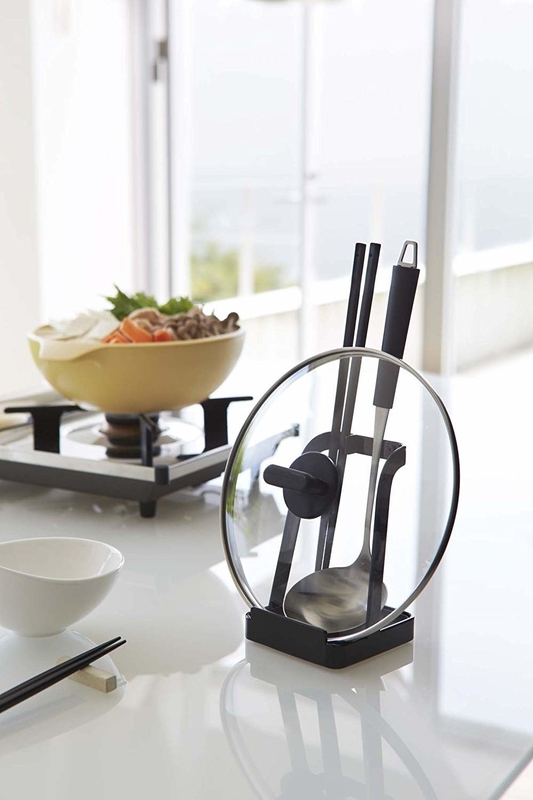 A six-piece knife set with an acrylic stand to make your knives seem like they should be part of a modern art exhibit, except that exhibit is your kitchen. These knives should be hand washed and immediately dried to prevent rust. 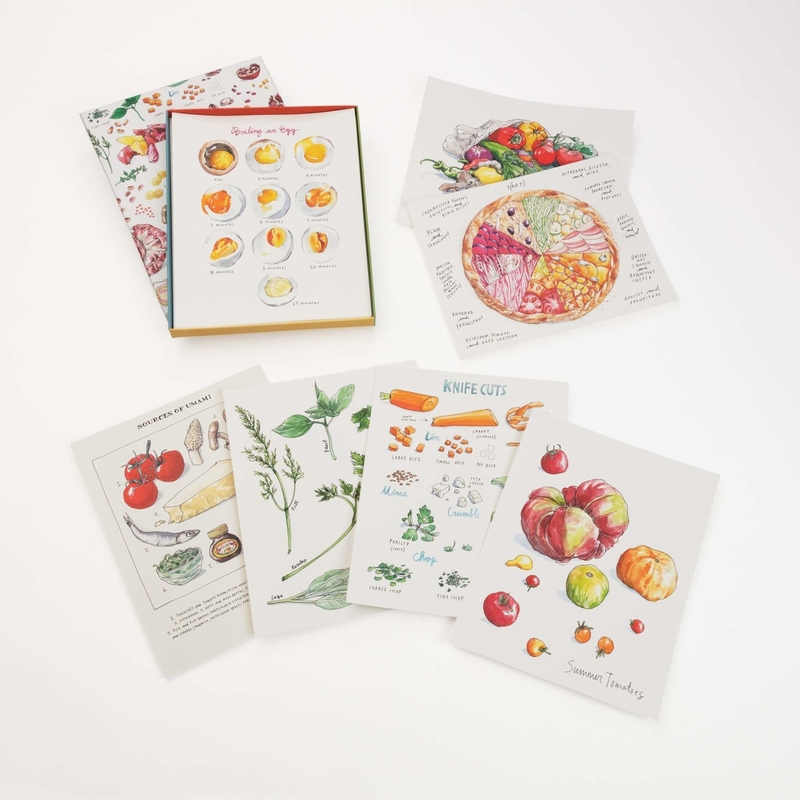 The set includes an 8-inch chef knife, an 8-inch bread knife, an 8-inch carving knife, a 5-inch utility knife, a 3.5-inch paring knife, and an acrylic stand for easy storage. Promising review: "Seriously, the best knife set you can get for this price. They LOOK expensive, the design is unique, the knives work great, and it saves so much space in the kitchen! Every time I have guests over, they ask about this knife set. And if you do not like the "utopia" label, it is only on one side so just turn the set the other way!" —R. M.
Get it from Walmart for $19.54. 13. A set of eight kitchen utensils – you might feel like you're a contestant on Top Chef when you use 'em. Just be sure to be ready to pack up your knives if your cooking doesn't work out like you hoped. It includes a solid spoon, slotted spoon, soup ladle, paster server, solid turner, slotted turner, round spatula, and regular spatula. Promising review: "This product is really great! 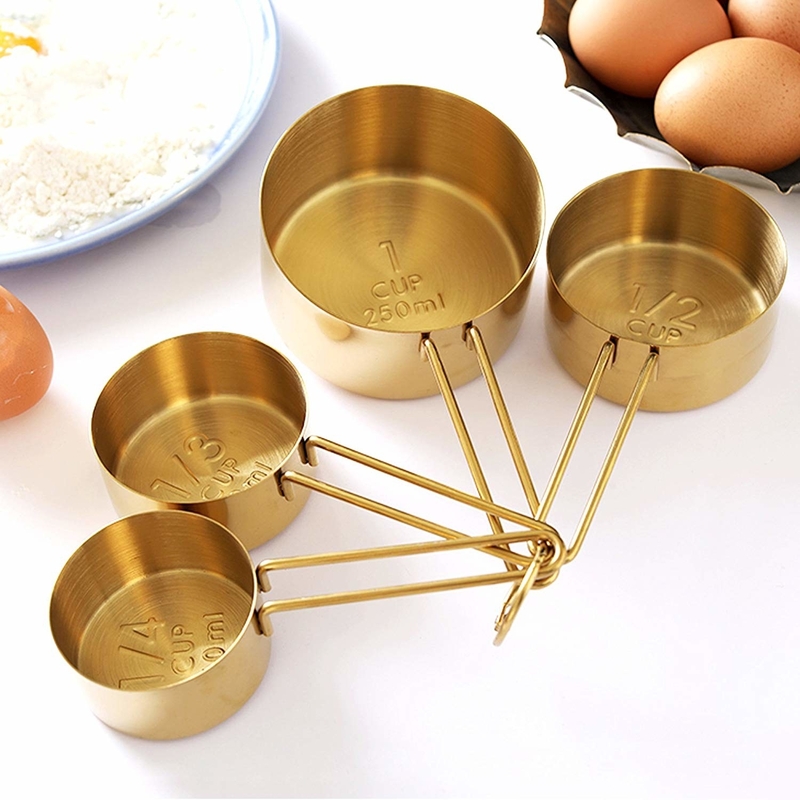 I love cooking with wooden spoons, and I love how this has the wooden handles and the silicon base, which makes it perfect. They are sturdy and feel very expensive. Plus, they are very well made. I couldn't be happier." —Rachel L.
14. Some confetti stemless wine glasses to add a little ~sparkle~ to your next girl's night. 15. A stoneware rolling pin *almost* too beautiful to use. 16. A set of measuring cups to add a bit more color to your world. Get it from Amazon for $17.99+ (available in 35 oz, 50 oz, and 64 oz sizes). 18. An acacia wood utensil holder – it's so simple and classic you wood be making a mistake if you don't add it to your kitchen. The utensils are sold separately, but are also reasonably priced! Brandless takes out the middleman and sells quality items at a fraction of the price you'll see at typical retailer. Plus, every time you check out, a meal is donated through Feeding America. I call that a win-win. Now, excuse me while I go stock up my new kitchen. Get it from Brandless for $9. 19. 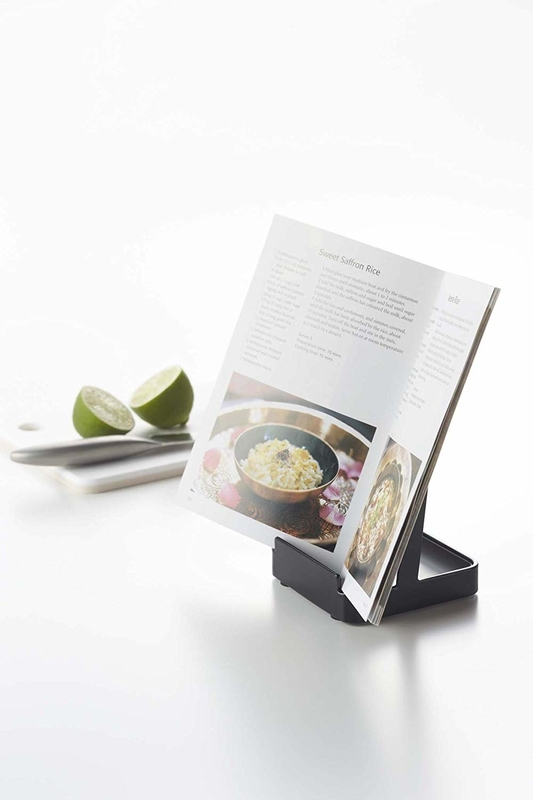 A convenient multipurpose kitchen stand designed to hold a pot lid and ladle while you cook, or keep a cookbook open to make things a little easier. 20. A three-tier stackable wine rack because it's a fact that ~fancy~ people have racks to display their wine bottles. Get it from Amazon for $18.99 (available in copper, gold, and silver). 21. A test tube vase to help your table decor really ~bloom~. 22. A glass teapot with a removable infuser so beautiful, the queen probably uses one during her afternoon tea time. This kettle is safe to use on the stovetop and can be put in the dishwasher on the top rack. 23. Some faceted glasses that'll look super ~sharp~ in your kitchen. Yes, they are dishwasher safe! 24. A small cake stand you can display those delicious deserts on during your next gathering. Get it from Amazon for $18 (available in pink and white). 25. A set of 20 art prints with some pretty useful information that'll basically be your own version of "phone a friend" when you're cooking dinner. 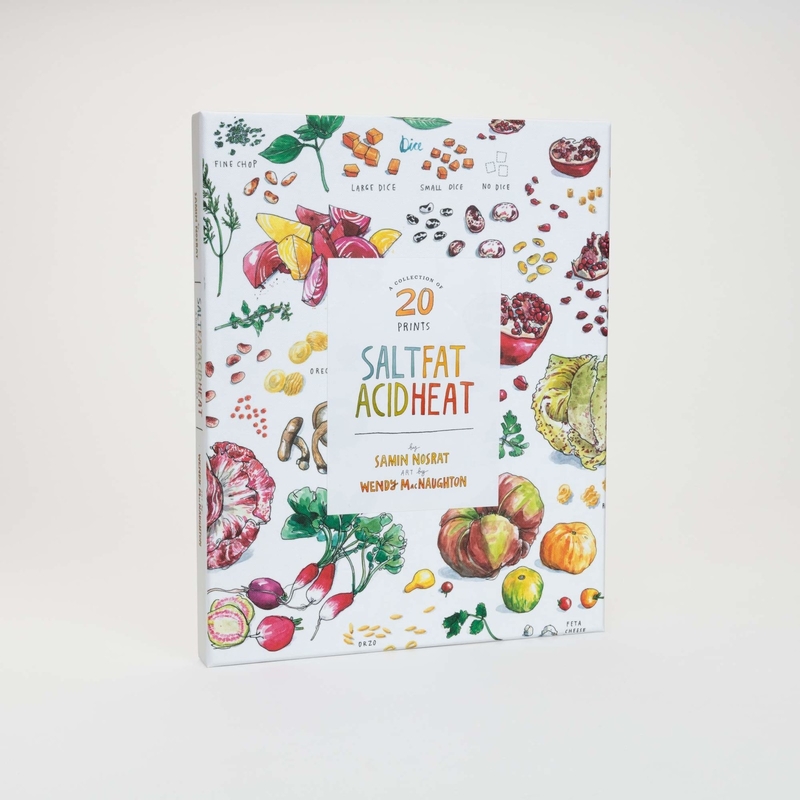 Get it from Amazon for $14.93. 26. And a stainless steel flatware set because you shouldn't have to fork over a ton of dough for gorgeous silverware. Get a set of 24 from Amazon for $19.99 (available in black and gold).